Choosing the right cot mattress for your newborn is very important; many experts have spoken about the dangers of babies sleeping on beds which don't offer enough support for them. If you're considering buying a baby mattress in the near future for your child you would do well to read this article first to find out what you need to look for in a bed and gather a few tips about how to ensure the bed remains clean. The size of cot you buy should is one factor you need to think carefully about, generally speaking there are two standard sizes on the market, a 56x118cm model or a 60x120cm mattress. If you've already purchased a cot it will state in somewhere in the instructions or packaging what size mattress is will facilitate. If you haven't purchased a cot yet or are buying everything as a set either of the aforementioned sizes will be fine as long as you buy the corresponding mattress size to the cot. 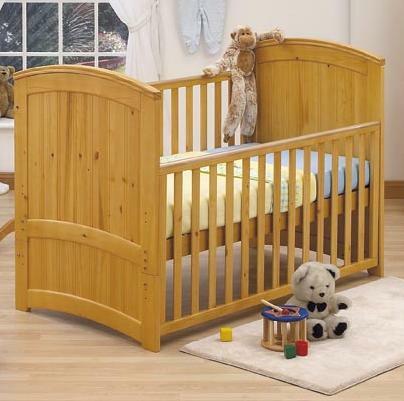 If you buy a mattress which is too small for the cot you will have gaps between the cot railing and the mattress, these are extremely dangerous and need to be avoided at all costs. Experts also recommend you actually buy a cot mattress in store rather than over the net, it is much easier to determine the suitability of a mattress this way. The softness of a baby mattress is paramount, you need to find the perfect balance between comfort and support which will ensure your baby isn't sleeping on too hard a surface but is not sinking into the bed either. Accidental suffocation has been known to occur in mattresses which are too soft so it is essential you buy one which offers enough support. If you're stuck for the type of mattress to buy I can't recommend coir mattresses enough, they are very firm which means your child isn't at any risk of sinking into one and they are designed to stand the test of time which means you won't need to buy a replacement any time soon. The only downside to coir mattresses is that they aren't as easy to find as many conventional baby cots because many stores don't stock them, they also tend to cost a fair bit more than the majority of the other alternatives on the market. If you are interested in buying a coir mattress bebeonline.com offer several products, I recommend you try all beds out in store first but the site will give you a good idea of what to look for.